(MENAFN - Gulf Times) The Qatar Insurance Company (QIC) Group, a leading insurance conglomerate in the Mena region, recently honoured its employees with long-service award certificates for completing 10, 15, 20, 25 and 30 years of dedicated service in the company. 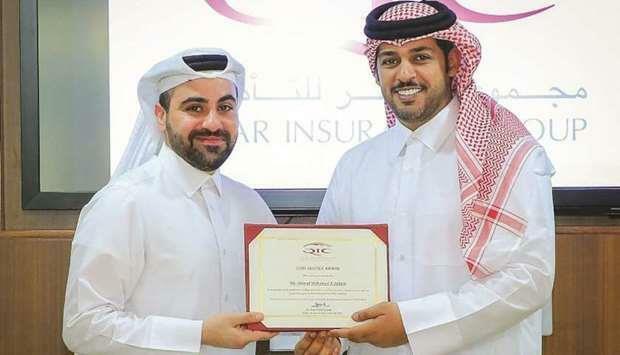 The award ceremony was held at the QIC headquarters in West Bay. The long-service award certificates were handed over to the awardees by Salem al-Mannai, deputy group president and chief executive of the QIC Group, in the presence of senior QIC officials. Expressing gratitude and appreciation during the event, al-Mannai said: 'At QIC, we believe that the dedication and collective efforts of our staff play a significant role in achieving QIC Group's set targets, growth and development of the company and in taking QIC to where it is today. 'We have always recognised the wide spectrum of capabilities and skill sets of our staff and going forward, we will continue to encourage them to sharpen their skill sets through various training and development programmes. He continued: 'We are delighted to organise this employee recognition ceremony. It clearly highlights our way of treating our human capital as the ‘most treasured asset'.